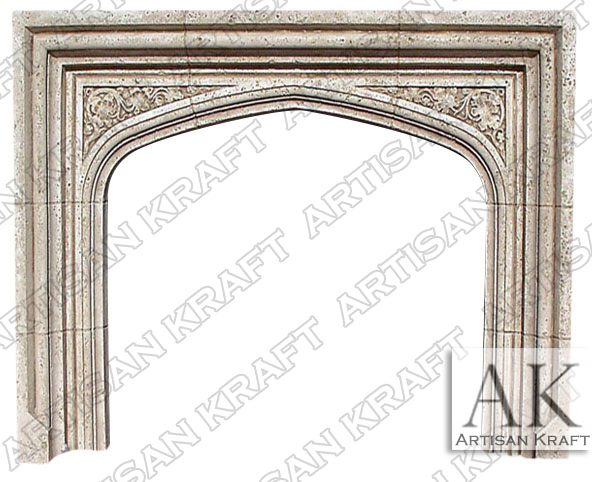 English Tudor fireplace mantel is best made from limestone and sandstone. Cast stone is another popular option of material for these English designs. This is a standard English surround with a peaked opening and frame design. It can be made with or without the additional seam lines. The frame has multi curved and angled steps. Leaves are commonly carved into the mantel shelf. The design of the leaves varies and can include oak, roses, vines and shields. There are other Tudor styles and designs with mantel shelves. We have a large selection of Tudor Fireplaces such as that one that is linked. These surrounds are usually available from our stock and can be shipped quickly. Typical Dimensions:69″ wide x 50″ high *order to size.